This is the second day of our 5 Day Instagram Challenge! If you haven’t already, you can join the challenge by following us on Instagram or by joining the Sweet Water Sisterhood Facebook group. Today your challenge is to CREATE something. When you shift into creativity, your sense of time changes. You shift out of a space of productivity and managing to-do lists, and into a space of freedom and self-expression. Many artists have talked about this sense of timelessness when they are in the creative zone. Taking time to be creative actually helps you to become a better problem-solver, increases your self awareness, and relieves stress. Make a collage from magazine clippings (images that represent how you want your life to be, perhaps; or maybe just images that you are drawn to). Color! There are lots of meditative and intricate coloring books available in stores these days. Choosing your colors and filling in the spaces can be a calming experience as well as a creative one. Paint a picture – watercolors, poster paints – whatever you have will be fine! There’s no need to go out and buy supplies. You could also paint an outdoor object – like a pine cone or stone. Bake or cook something new. For many people, cooking is a creative endeavor, as much as it is a practical task. If cooking is a way you express yourself, don’t hesitate to create in this way. Sew, crochet, or knit – if these are activities you already know how to do, then they are a great way to express your creativity today. I wouldn’t recommend choosing a new skill to learn today, as it’ll become less about creativity and more about technical skills (and it could end up being a frustrating experience, instead of a freeing one). There’s lots more inspiration on our Pinterest page, if you need more ideas! Or, if there’s a project you’ve already pinned and been meaning to do for awhile, perhaps today is the day! Also, doing a project with your kid(s) totally counts!! Even when I’m doing a “kid project,” I still move into that creative zone and reduce my stress level (as long it’s not causing too giant of a mess!). 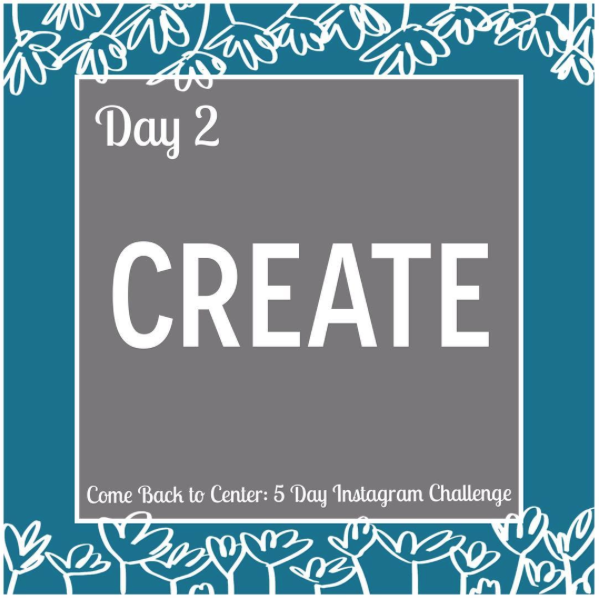 Once you’ve created something, I would LOVE it if you’d post a photo in the Sweet Water Sisterhood group or on your Instagram with the tags #ComeBacktoCenter, #Create, #SweetWaterOffering, and/or #5DayChallenge. Don’t be embarrassed to share yours! One of the myths we believe is that it’s not worth creating if we’re not good at it, but creating is less about the results and more about the way it changes us. So whether creating is your “thing” or creating takes courage for you, I challenge you to jump in a give it a try for about half an hour today. You might be surprised by what you come up with! Simply follow Sweet Water Offering on Instagram or request to be added to the Sweet Water Sisterhood group on Facebook to get your daily challenges.